between 88th & 89th St. 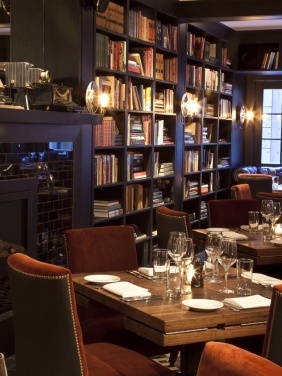 The Writing Room evokes an old school and literary feel, and offers a $17 prix fixe. It's a warm and inviting spot good for a casual, hearty brunch. Inside you'll be surrounded by brick walls and vintage photos, and there's a lot of booth seating. Try to score a table in the back near the fireplace and large wall stacked with books. This section is equally good for a large group brunch celebration. The entree options here are pretty standard. Go with the Waffle with Fresh Strawberries, Vanilla Whipped Cream, and Maple Syrup, or the Cured Salmon with Everything Spiced Bread, Tomato, Onion and Herb Whipped Cream Cheese. The big thing to write home about are the starter Cinnamon Rolls. They make a great group appetizer, as the portion size could serve an army. They come with a fabulous Caramel Glaze too. The $17 prix fixe includes a Mimosa, Bellini, Bloody Mary or Draught Beer. You can also order Champagne Bottle Service for $25. It's served with Orange Juice and Peach Puree. 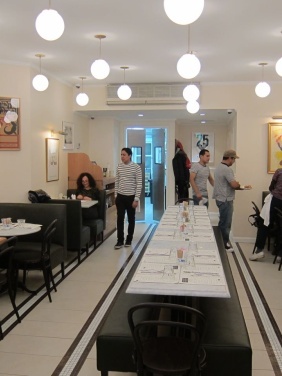 After the success of Jack's Wife Freda on Lafayette St., they've opened up a second, larger location on Carmine. As a friend once told me, it's the best brunch your grandmother would eat if she walked in with TOMS shoes and listening to Mumford and Sons. This Mediterranean/South African/Modern Jewish establishment is a hit (and the service is some of the friendliest in town). Definitely start with the delicious House Cured Duck Bacon. Then select from the large, Mediterranean inspired menu. The Eggs Benny has a Beet Hollandaise, and the Green Shakshuka is served with 2 Baked Eggs and Challah Toast. Alternately, Freda's Matzo Ball Soup might be just the thing for the freezing weather we're having. For desert choose the Baked Fruit Crisp or Flourless Chipotle Chocolate cake. It has more chocolate than chipotle, and it is awesome. Jack's Wife Freda has wine, beer and cocktails available, but for something with a twist, try the Cantaloupe Mimosa. Only brunch reservations for parties of 6 or more, booked in advance, are accepted.